Mevagissey is one of the few remaining active Cornish fishing harbours. In the small town you can enjoy the local shops, boutiques, and art galleries. There are cafes, pubs and restaurants, as well as places to stop for a cream tea, fish and chips or an ice-cream. There is even a handmade fudge shop! A visit to the museum and aquarium on the harbour is recommended. Freshly caught fish are often available to buy from the quayside. There are many walks that can be enjoyed from the cottage, but most popular are those along the coastal path leading from the harbour. Mevagissey is fortunate to have a cycle path that meanders to St. Austell and beyond and has a ferry to take you to Fowey. There are a great variety of activities to suit all interests. Fishing trips and scenic boat trips are available from the harbour. If you enjoy watersports or a day out at the seaside, sandy beaches are close by. For garden enthusiasts many popular attractions are within easy reach, including;The Lost Gardens of Heligan, Caerhays Castle, The Eden Project. There are several National Trust properties. If you are interested in popular culture you will enjoy a visit to the nearby 18th century harbour village of Charlestown. One of Britain's most popular film locations, it was used in The Eagle Has Landed and most recently the new Poldark series and in many others in between. I was born about 10 miles from Mevagissey and have fond childhood memories of visiting my friend's Grandmother there, skipping through the streets, eating ice-cream whilst sitting on the rocks near the harbour; pretty much doing the sorts of things that our visitors to Mevagissey still love to do today. As an adult I studied art at Falmouth and remain inspired by the familiar landscapes of the south west. These days I eat less ice cream and walk through the hilly streets and coast paths which is a great way to stay fit and enjoy some amazing scenery. I love how Cornwall with her tides and unpredictable weather reveals herself serendipitously to those who take the time to explore. For example, during a recent walk I stumbled upon the wreck of the 'Romanie', believed to be the inspiration for Daphne Du Maurier's 'Rebecca'. I hope that if you come to stay at Chorister's Cottage you and your party will take away with you equally fond and inspiring memories. Having grown up in the St.Austell area, I later moved to Truro and from there began living part time in London. 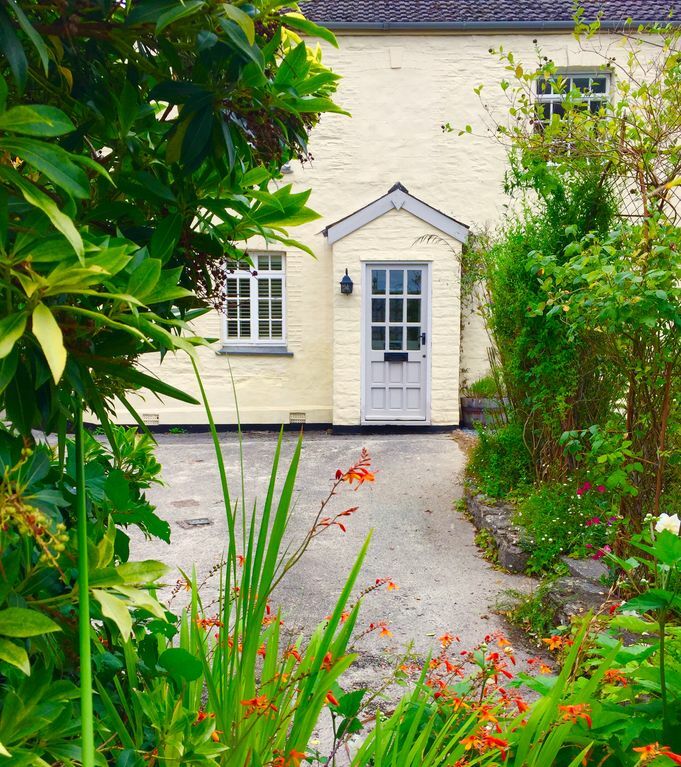 It made sense for me during this time to downsize from my home in Truro to a cottage in my best loved corner of Cornwall. I am delighted to now have my own home here once again. Mevagissey, in my opinion, is one of the few Cornish fishing towns to still retain its integrity as such, it seems little changed since my childhood. I still live partially in London, but knowing that I will always spend some of the year in my home county, my criteria for a second home was to be close to my family and within walking distance of the sea and a pub or restaurant. It is a bonus to be in this part of the Cornwall, an 'Area of Outstanding Natural Beauty'. Also I wanted easy access to the South West Coast Path. Parking was important as having the convenience of my own car to explore Cornwall and visit friends and family when here is essential. Finally I wanted a comfortable and cosy home with a real fire and a traditional feel; Chorister's Cottage ticks all of those boxes. I look forward to sharing this beautiful part of Cornwall with you. Whenever I return to my cottage it feels like coming home and I aspire to create an ambiance that is comfortable and homely in the hope that my guests will also feel at home. In addition to the accommodation inside the cottage there is a delightful garden area at the front which gets the sun for most of the day. Being tucked away behind the old St.Peter's Church, this is a quiet and peaceful setting. The tranquillity of this hidden corner of Mevagissey contrasts with the activity and bustle of the beautiful harbour, yet it is less than a five minute, relatively level walk away. I am a romantic at heart and so the subtle details like the cries of the seagulls and, the birdsong of numerous other wild bird species during my stays here is a joy. In addition, at night time there is usually an owl hooting, bats flitting about the street lamps and when the sky is clear the stars never fail to delight me. Bathroom with bath/shower over, wc and sink, heated towel rail. Lounge with 2 leather sofas, wall mounted LCD TV, Blu ray player. Dining room with oak dining room table and 6 chairs. Wood burner. The is a small garden directly in front of the cottage which is quite private but not enclosed. The Lost Gardens of Heligan are within walking distance of the cottage. Outside: Large paved garden surrounded by pretty herbacious boarders. Outside table with 6 chairs, parasol and barbecue. Views towards St. Peters church. The garden is not enclosed. Cleaning / Towels / Linen / Maid service: Towels and bedlinen are included and changed weekly. The cottage is cleaned prior to guests arrival. Chorister's Cottage is a delightful home away from home. Cosy, comfortable and close to Mevagissey's picturesque harbour, restaurants, pubs and shops. We parked two cars on the property's drive space and enjoyed the outside area which proved to be a sheltered suntrap. Inside the kitchen facilities were more than adequate with comfortable space to move around and prepare food. The surprisingly large dining table gives ample room for six people to eat or play games (found in the sitting room). The sitting room settees and chair were great for relaxing with conversation or watching TV or films. Two bedrooms were spacious and the third had limited room around the double bed. All were comfortable and enabled a good night's rest for all six of us staying. The bathroom was clean and provided shower and bath options in a fairly small room. No en-suite facilities which would have been handy. There is an outside toilet if needed lol. Ideal situating for a warmly welcoming and sweet town. The parking it provided was wonderful - would not like to stay in Mevagissey without it! The cottage needs more TLC. The sitting room is overcrowded by the vast coffee table and this makes it very hard to move around without disturbing fellow guests. It also prevents the log burner being used. The master bedroom is lovely but the second and very small room could do with some means of hanging clothes. Bedroom three is pleasant and adequate. The stairs are very steep and the lovely old door handles throughout the property are difficult to open for older people, in fact I got trapped in bed2 until my friend got up and was able to release me! Both of these should possibly be mentioned in the write up to warn retirees and people with disabilities the cottage may not suit them. Bedrooms should have waste bins and warnings should be given where utilising electric sockets causes problems. Having owned a holiday rental myself I feel all the points I’ve made are fair. December 27th 2018 - January 3rd 2019. Lovely cosy cottage with a good well finished interior, and wood burner in the spacious dining room. Having 2 / 3 parking spaces and a nice garden is a definite bonus in Meva. We would certainly recommend Choristers Cottage, and would be very happy to stay again. This is a lovely, well appointed cottage. It had everything we needed and was a warm and comfortable place to stay. It was quiet despite being only a 5 min walk to the harbour. Jacqueline, the owner was welcoming and very thoughtful during our stay. Perfect cottage for relaxing break, loved Mevagissey. We had an enjoyable few days in Chorister's Cottage and recommend it to others. Mevagissey harbour has a small beach area, fishing,crabbing and boat trips. Pentewan Sands- A few mins car journey can be reached by the coastal path. Watersports and bike hire available. Polstreath - a beach to the north of Mevagissey, about 15 minutes walk from the cottage. Portmellon - small cove to the east of Mevagissey, about 20 minutes walk from the village. Vault Beach, just beyond Gorran Haven, listed by the Guardian as one of the worlds best wild beaches. Car rental is recommended if you wish to explore Cornwall and its attractions. Mevagissey 0.3 Miles, St Austell 5.7 Miles. St. Austell is the nearest large town. It has a cinema, supermarket, banks, restaurants, pubs, shops and St. Austell Brewery. The delightful old harbour village of Charlestown, just a mile or so south of St.Austell, is well worth a visit. Charlestown is home to a Shipwreck Centre and has a selection of art galleries, shops, pubs, restaurants and cafes. Changeover Day: Change over day is Saturday - after 3pm arrival. Departure before 10am on your final day. Notes on prices: Short break bookings of a minimum of 3 days, please email for availabilty and pricing. During quieter times we can be flexible on holiday start days and can offer a couples discount for bookings of 7 days or more.